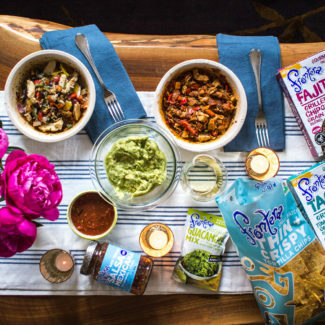 New Mexican foods are defined by the history of Pueblo Native Americans and Spanish colonialism combined with modern-day Hispanic and Anglo cultures in New Mexico. I had wrongly thought that New Mexican cuisine would be just like Tex-Mex food. While many of the basic ingredients remain the same, and there are similarities, New Mexican food is unique. I want to let you know that I noticed an abundance of vegetarian meal options on the menus in Santa Fe. 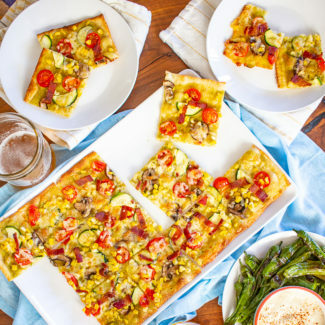 Cheese is a staple, so it might be a little more challenging for vegans. When I was in Santa Fe I fell in love with New Mexican food to the point where I suffered from serious heartburn from eating so much spicy food. I love the food so much that I couldn’t stop eating it, even when it caused pain. Here is my list of New Mexican foods, unfortunately, some of these meals aren’t the most photogenic. What they lack in looks they make up for with taste. Chiles are so important to New Mexicans that red and green chiles appear on the state’s license plates. “Red or green?” is a question commonly asked by servers at restaurants since so many meals come with chile sauce on top. If you want both red and green chile sauces on your meal, that is “Christmas”. The process of making red chile sauce and green chile sauce is different. 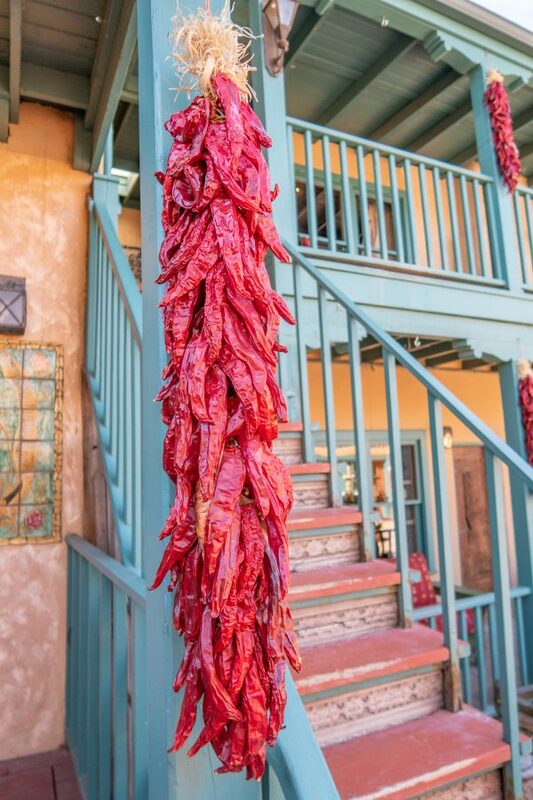 Red chiles are dried in a ristra (pictured above) and then ground up before being turned into chile sauce. Green chiles are roasted, peeled, and turned into sauce. Red chile sauce is smooth, and green chile sauce often has small chunks of chopped chiles. I think that green chile tends to be spicier, but it depends on the restaurant. I personally love eating the chile sauce Christmas style. And yes, it’s spelled chile and not chili in New Mexico. 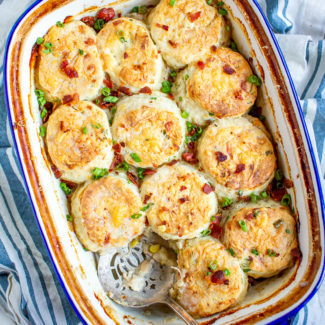 You will find pinto beans in many recipes. Beans, corn, and squash are called the “three sisters” and they were the basis of the diet of the Pueblo peoples. Black beans appeared in a couple of meals, but Santa Fe seemed to favor pintos. This photo shows pinto beans and cheese spilling out of a pupusa. Blue corn is a typical New Mexican food that you will find in tortillas, tortilla chips, muffins, and pancakes. It has a nuttier flavor than yellow corn. Freshly baked blue corn chips were a special treat during our trip. We discovered this delicious food at the Santa Fe Farmer’s Market. 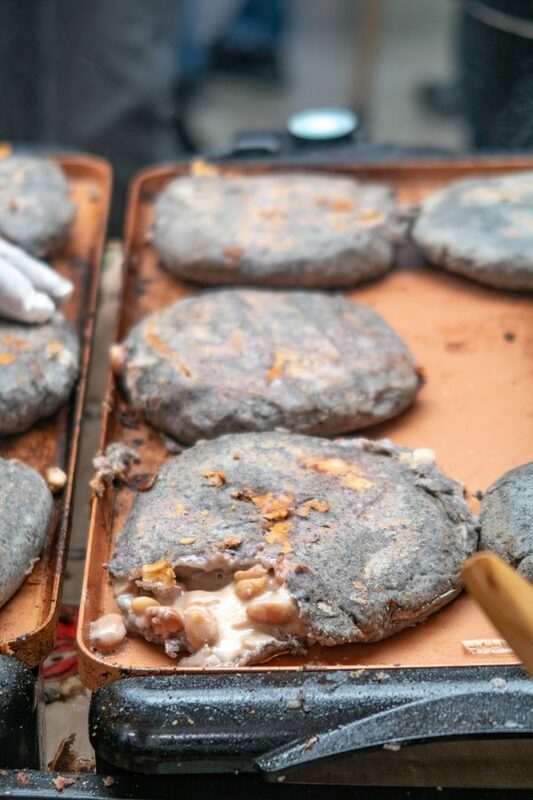 A pupusa is beans and cheese stuffed inside a masa corn cake that is cooked on a griddle. 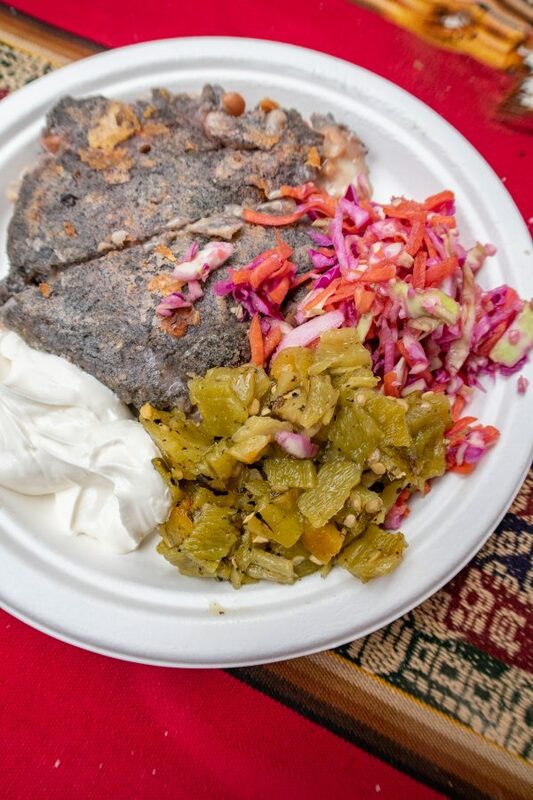 It is served topped with curtido (a cabbage slaw), chiles, and sour cream. Pupusas originated in El Salvador, but are popular in Santa Fe. Santa Fe pupusas are often made with blue corn. 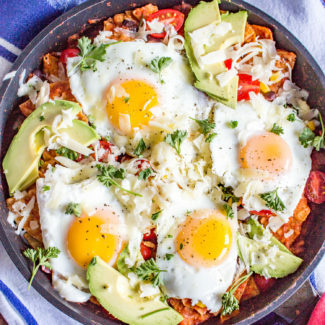 This traditional New Mexican breakfast is on menus all across the country. 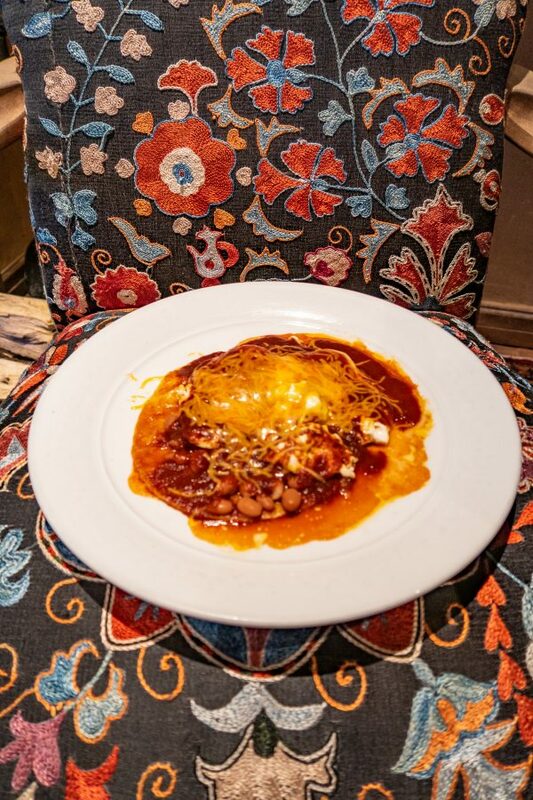 A fried corn tortilla is topped with beans, chile sauce, eggs, and cheese. Usually, you are given the choice of how you would like the eggs prepared, and I love how sunny side up eggs paired with this meal. In New Mexico, huevos rancheros are served with red, green, or Christmas chile. Frito Pie is made of Fritos topped with beans in a spicy chile sauce, cheese, and onions. 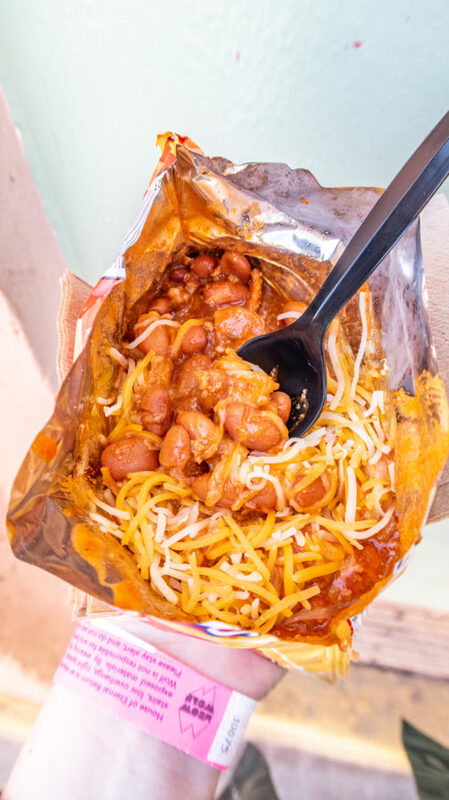 If you go the Five + Dime in the plaza, the Frito pie is very similar to a walking taco; it’s served right out of a bag of Fritos. 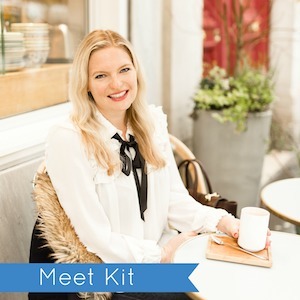 The recipe and preparation for Frito Pie vary. Sometimes it has meat, and it isn’t always served right out of the bag. You will find this bread on menus in New Mexico and it’s delicious. 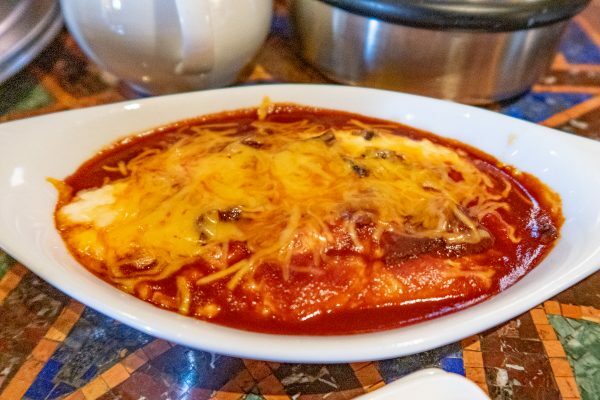 Enchiladas combine some of New Mexico’s most essential foods: corn tortillas, chile sauce, and cheese. 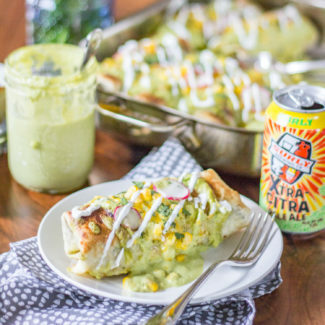 While restaurants serve rolled enchiladas, many people make enchiladas layered like lasagna at home. 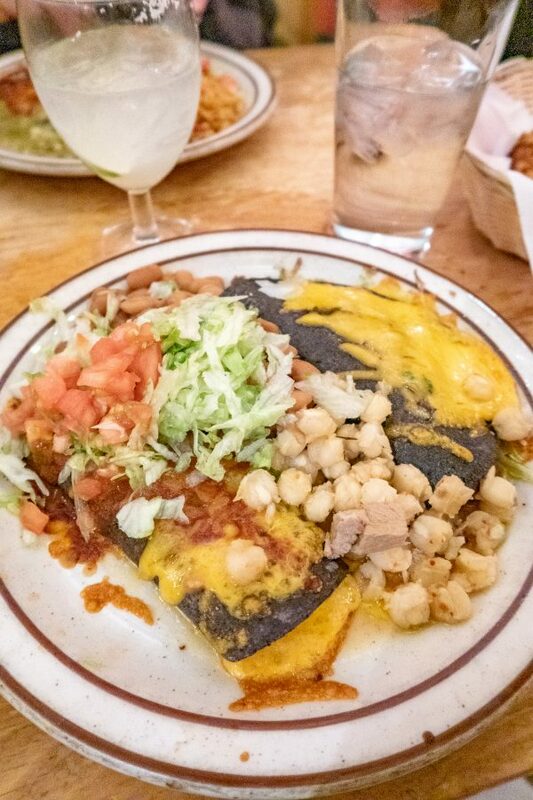 The Shed is known for their enchiladas, which are made with blue corn. This is the official state cookie. 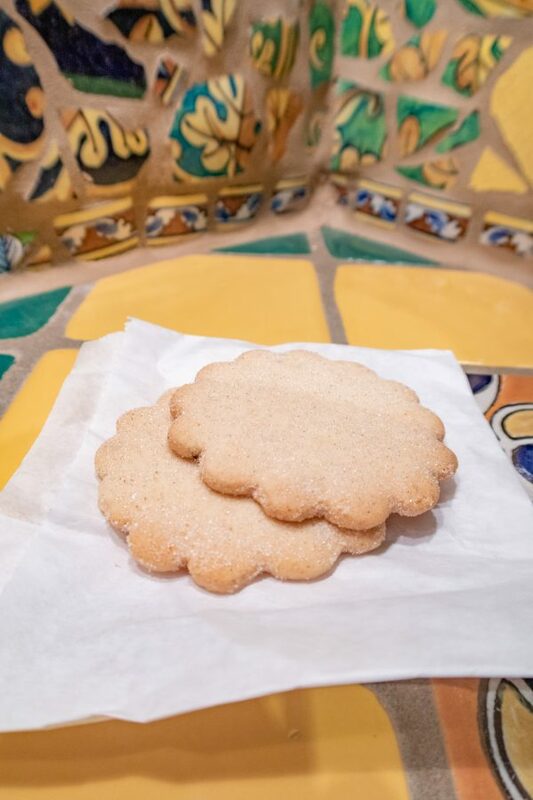 It is a thin cookie that tastes like a mix of shortbread and a sugar cookie. It is topped with cinnamon. 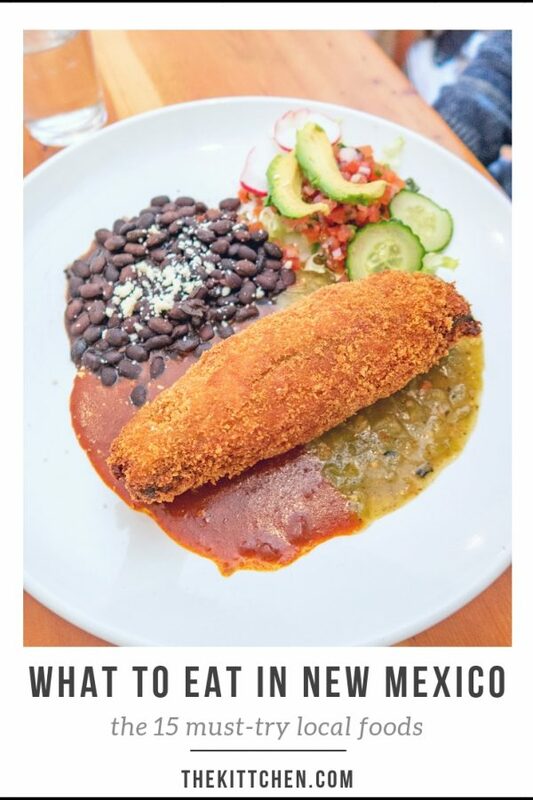 Chile Relleno is a dish comprised of a New Mexico green chile pepper that is roasted and filled with cheese and often beans. It is served smothered in chile sauce. It might be breaded and fried. 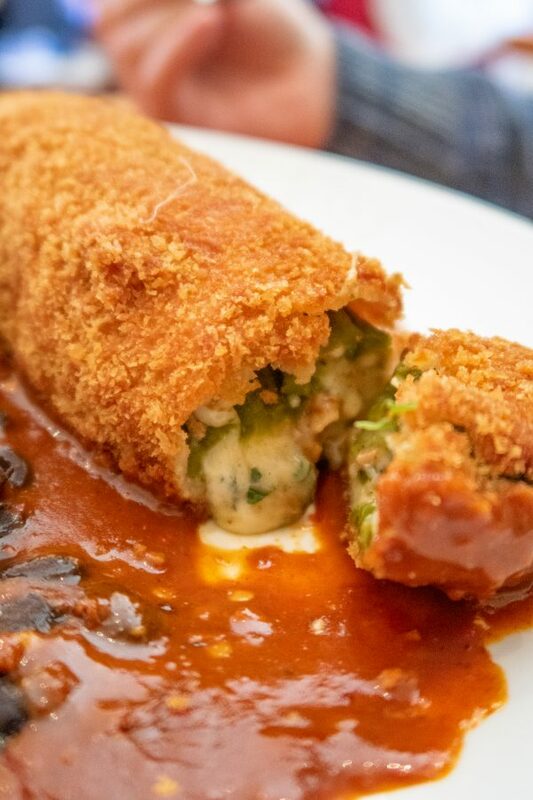 Chile Relleno is a food that you can find outside of New Mexico, but it tends to follow this specific method of preparation in New Mexico. 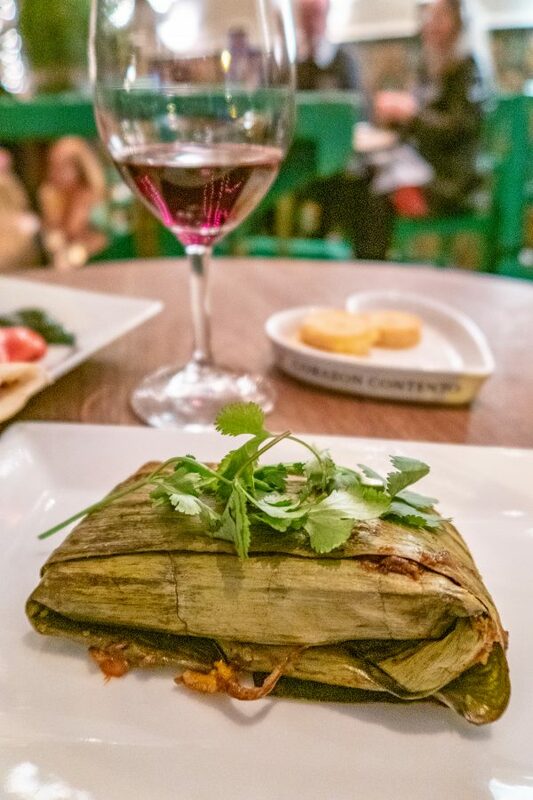 In Santa Fe tamales are wrapped in green banana leaves instead of corn husks! Margaritas aren’t specific to New Mexico, but they seemed to be the most popular cocktail in the state. 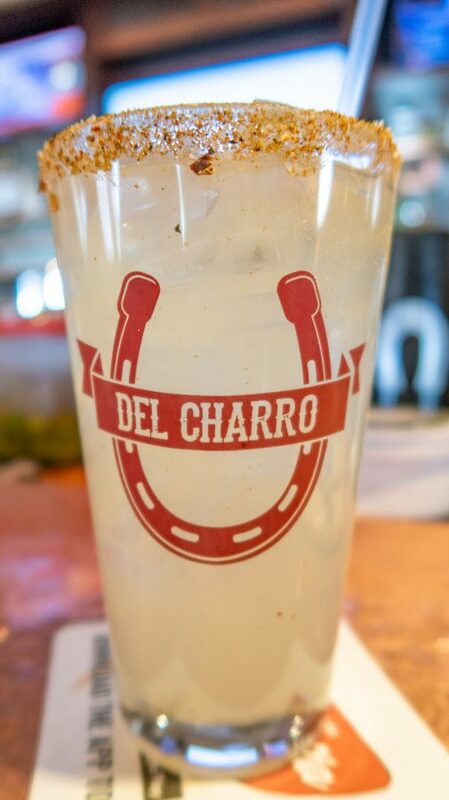 Many bars and restaurants had up to a dozen different margaritas to choose from. Beware, the high altitude of some New Mexico cities makes these cocktails extra powerful. Plus, we noticed that bars seemed to serve margaritas out of pint glasses, which is a bit larger than usual. Posole is a stew made with boiled field corn, pork, and chiles. I know, this photo looks like just a pile of food. It’s a blue corn enchilada and a blue corn taco topped with posole from The Shed. The posole looks like white garbanzo beans. This is a light fry bread that may be served with honey or filled with meat, cheese, chile, or beans. Did you know that this popular breakfast food was invented in Santa Fe in 1975? 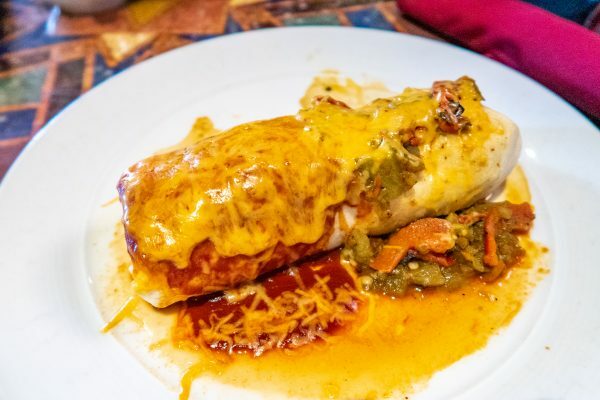 Breakfast burritos can be found all over the U.S., but a Santa Fe Breakfast Burrito might come topped with chile sauce. The food in New Mexico is reason enough to visit the state. Just maybe pack a heartburn medicine. 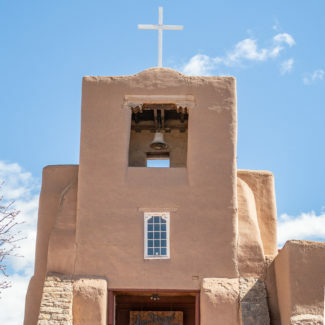 Have you been to New Mexico? 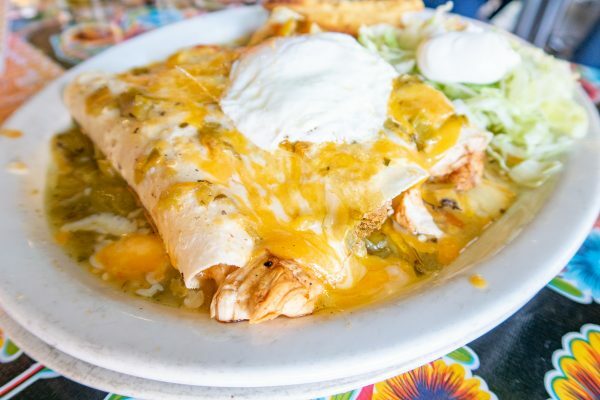 Share your favorite New Mexican foods in the comments.